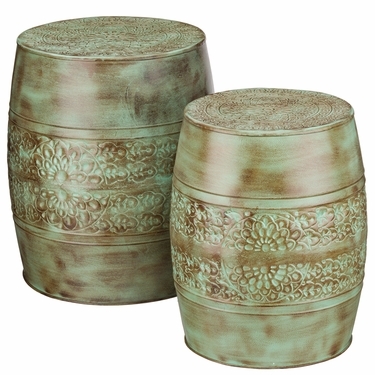 Our Patina Flower Garden Stools are wonderful, and multi-functional! These versatile metal garden stools can be used as an accent table, planter, ottoman, or as extra seating for unexpected guests. The beautiful design is created using embossed metal. Painted to look like well-loved weathered green patina. Sold as a set of two different sizes (nesting) and are made from durable weather-resistant metal for indoors and out. Sizes: 15.5" x 19"H and 13" x 17"H. Each holds up to 200 lbs.